Motorcycle helmets save lives and reduce the risk of a cyclist suffering a traumatic brain injury. Mile per mile, motorcyclists are 29 times more likely to suffer a fatal accident than occupants of passenger vehicles. It is a statistic that highlights the importance of helmets and the effect they can have on accident outcomes. According to the National Highway Transportation Safety Administration, 4,976 people died in motorcycle accidents in 2015, up about 8.3% from 2014. Another 88,000 motorcyclists suffered serious injuries, which was a decrease of 4.3% from 2014. While encouraging, the NHTSA showed that motorcyclists were 5 times more likely than occupants of passenger vehicles to suffer serious injuries in a car crash. Nationwide, motorcyclists suffer 14% of all traffic fatalities. Older cyclists are at greater risk with riders over the age of 60 suffering more than twice as many injuries as younger riders under the age of 40. These injuries include fractures, dislocations, and traumatic brain injury. In 2015, approximately 27% of motorcyclists involved in fatal accidents had blood alcohol concentrations exceeding the legal limit. This is higher than the 21% recorded for drivers of passenger vehicles, and the 20% recorded for those driving light trucks. 42% of fatal motorcycle accidents involving alcohol occurred during the evening hours. NHTSA records show that 33% of fatal motorcycle accidents cited speed as a contributing factor. This is considerably higher than the 19% recorded for accidents involving passenger vehicles and 7% for light and large truck operators. Nationwide, helmet use is declining and recent data shows that regular helmet use has fallen from 71% to 58% over the past 15 years even as more states implement and enforce mandatory helmet laws. While there have been numerous attempts to pass a motorcycle helmet law in Illinois, these attempts have not passed the legislature. Currently, Illinois is one of only three states in America that does not require motorcyclists to wear helmets while riding. Data collected by the Fatality Analysis Reporting System shows that from 1993 to 2002, about 7,808 lives were saved due to the use of motorcycle helmets. Further analysis of this data showed that if all cyclists had worn their helmets consistently, that number could have risen to as high as 11,915. Information gathered by the National Center for Biotechnology shows that 32% of riders injured in accidents in states where partial helmet laws are in place suffer head and neck injuries, and 8% suffer traumatic brain injury. By comparison, 18% of injured riders in universal helmet law states suffer head and neck injuries, and 5% suffer traumatic brain injuries. Thus, it is clear that full helmets are saving lives and reducing head, neck, and brain injuries. New materials and technology are coming together to make helmets more effective than ever. Products such as Koroyd have shown that they can absorb 30% more energy than the styrofoam that filled older helmets. Helmets are also being equipped with heads up displays that provide a clear picture of objects to the rear of the motorcycle. These advancements are being coupled with composite shells that resist cracking, provide more support for the neck, and absorb more of the impact during a crash. Traumatic Brain Injury (TBI) occurs following a violent blow or sudden jolt to the head or the body. It can be mild, moderate, or severe and can occur even at low speeds while operating a motorcycle. Mild TBI can cause short-term loss of consciousness, headaches, nausea, dizziness, and sleep disorders. It can also cause blurred vision, light/sound sensitivity, and difficulty with concentration and memory. Moderate and Severe TBI can cause loss of consciousness for minutes or even hours. It can involve severe headaches that persist, seizures, convulsions, muscle weakness, loss of coordination, and severe confusion. It is also known to cause significant problems with memory and coordination. In some cases, it may also place the individual into a coma. Mild TBI generally heals after a few weeks, however, symptoms can persist for much longer. In the case of Moderate to Severe TBI, the prognosis for recovery is highly variable. Serious brain injuries can cause permanent changes to an individual’s mental state, cognitive functions, and personality. They can affect an individual’s mobility, ability to perform a job, and can have a significant impact on personal relationships and quality of life. Car accident attorneys in Chicago and the motorcyclists they represent can pursue compensation for medical expenses, loss of income, pain, and suffering, and property damage. 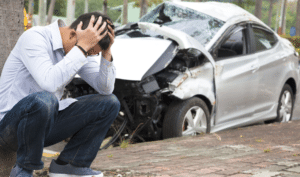 Because TBI and other injuries can have a significant impact on a victim’s quality of life following an accident, it is important not to delay filing a claim. Compensation can help injured victims recover physically and financially.